Why should you choose NotNoTrouble Ltd Website Design? When starting up a new business you face specific challenges which we at NotNoTrouble understand having been involved in a variety of company start-ups of our own. Many website design companies create quality sites that are not affordable to the majority of businesses, whilst others create very basic, poor sites which will need replacing quickly. At the same time, there are many sites that suffer from a lack of design variation, use little imagination and/or development ability. For this reason, we feel it is important to design bespoke websites that are individually-tailored to our clients' requirements. We can design you a web site from scratch, implement your own designs or give your existing site a makeover. We will work closely with you throughout the development phase to ensure that we provide you with what you require at a competitive price. The development of your website will also include free search engine submission to ensure your site is indexed by the major search engines. We will continue to work on your site until you are happy with every aspect - we do not limit you to a set number of hours' development like many other web designers - and the site will only go live once you are satisfied. Once your website is live we can provide ongoing support by means of a monthly Maintenance Contract. This will include regular checks to ensure that your site is running as it should and making any updates or alterations that you may require to ensure that your site is always up-to-date. Ali's Toy Shed sells diecasts, tinplate, railway models and most things toy and hobby related. Design: Consolidation of website that required additional elements included into the existing design. Blue Lizard Equestrian Ltd was set up by Claire Elbrow to supply her own equestrian clothing range as well as the well-known TEAML jockey's apparel and racing gear. Design: A full-blown online ecommerce solution using the comprehensive ekmPowerShop software. CAD Landscape Consultants is run by Alan Bucknall, a freelance landscape consultant, specialising in landscape design and project management and maintenance contract management. Design: A total re-design of the existing site with a frialy open remit. The client was open to any new suggestions and design layouts as long as it reflected his business. The Centre for Relationships, formerly The Centre for Self Development, operates in rural Suffolk and Central London. They are skilled and experienced practitioners who provide help to develop the understanding of relationship issues and an improved ability to deal with problems as they arise. Design: The site(s) has been through a series of re-designs and now utilises PHP coding and PayPal integration to simplify site updating. The Collectable Model Shop is an East Anglian based Collectable Toy and Model Dealer, run by enthusiasts who aim to supply Collectors with quality items. Design: Another full-blown online ecommerce solution using the comprehensive ekmPowerShop software. Dimensions Design Consultants is an interior management consultancy, advising on loose and fixed furniture, fixtures and equipment (FF&E) and logistics within both the Private and the Public Sector. Design: The client was very definite about the look and feel of the site they required, including Flash animation. Framing by Margo is a Suffolk-based firm located just outside Bury St Edmunds committed to providing quality, well-designed custom picture framing services to its clients. Design: The client was totally open to layouts and colours for the site - the starting point was a drawing of elephants to incorporate into a logo and a South African flavour to influence the look and feel of the site. Gamekeeper Supplies are suppliers of equipment to the professional game breeder. Design: The client was looking for a site that showed a comprehensive catalogue of items that they could supply, but did not want a full online shop as they wanted to retain the personal contact with new and existing clients. Old Cannon Brewery, Bar, Brasserie and Bed & Breakfast is a privately owned, genuinely independent free house in Bury St Edmunds and certainly the only brew pub in Suffolk where you can actually see beer in the making on a regular basis. Design: Although the basics of the site were already in existence, the overall design needed re-coding and rationalising, along with the addition of an online booking system and the inclusion of a blog using Google's Blooger system to tie in with the existing site design. 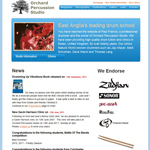 Orchard Percussion Studio is East Anglia's leading drum school, run and owned by professional drummer Paul Francis, providing high quality drum tuition and clinics in Essex, United Kingdom, for over twenty years. Design: Initial design was already in existence, although a site re-design is expected later this year, but the client urgently required PayPal integration into the site to enable the sale of new and existing merchandise. Two Sisters Gallery is a full-service custom framing shop, serving Columbus, Georgia and the surrounding area. Design: The site was already hosted by Yahoo and had to be re-designed within the restrictions of the Yahoo SiteBuilder software enabling the client to update the site themselves whenever necessary. If you have got this far and do not think we are the company for you, we wish you the best of luck. If, however, you are interested in getting more information or have already decided that we may be of service please do not hesitate to contact us.